The original 36”x24” oils on canvas is for sale, please contact us for details. Single Remarque prints will have a small pencil drawing at the bottom of the print on either the left, right or in the middle. 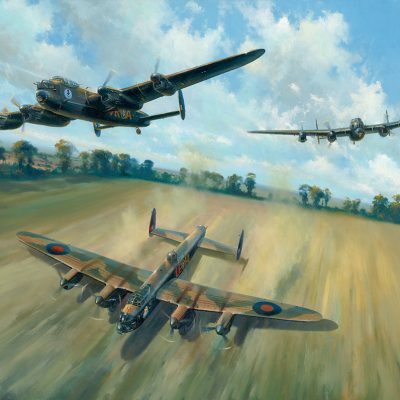 Artwork Size Choose an option33" x 24"36" x 24"
K-King of 158 Squadron returns in the evening light of 6th November 1944. A Halifax Mk111, she has been to Gelsenkirken to attack synthetic oil plants north of the Ruhr in Germany. She suffered heavy flak damage but with skillful flying, her pilot Flt. Lt W.N “Bill Sharp DFC was able to perform an emergency landing at Woodbridge in Suffolk. Repairs took 2 days and on taking off, the starboard outer engine blew up. However, she successfully completed the trip to her home base in Lisset om Yorkshire. 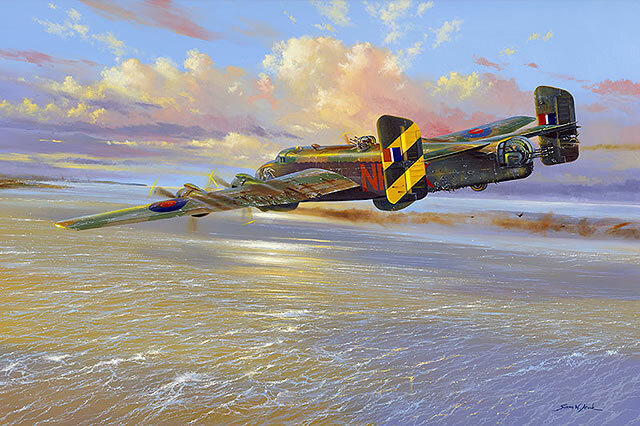 The painting was inspired by the first-hand account from her rear gunner Flt. Sgt. Geoff Towers BEM. 33" x 24", 36" x 24"